In this section we look at the geographic distribution of tektites. Tektites are not distributed randomly. They emanate from source craters in rays. Ejecta rays can contain a high abundance of tektites, adjacent to the ray tektites may be virtually absent. The next factor as to whether tektites will be found is geological. Tektites are often in lower abundance on high grounds where the surface is being eroded. They are also absent in areas where they have been deeply buried, or where rocks of the correct stratigraphic age are not outcropping. Tektites are commonly found transported, deposited and concentrated in alluvial gravels. The third factor is human activity. Where there are no humans, such as the deep seas, few or no tektites will be found. Where humans are digging the ground, for farming, house foundations, and alluvial mining tektites, if present, will be found. Ejecta rays are very evident in certain parts of the 786 ka Australasian strewnfield. In older impacts the patterns are largely lost. The Central European strewnfield at 14.34 (±0.08) million years old (Laurenzi et al., 2003) retains evidence of a pattern, although details cannot be made out. The North American strewnfield at 35.5 million years old is almost entirely controlled by stratigraphic outcrop of rocks of the correct age and is therefore unrepresentative as geological factors now control the distribution. Look at the moon and you'll see ejecta rays. The moon has lower gravity and no atmosphere. There is little to inhibit the ejecta rays. Look at Venus, a planet similar in size to Earth but with a dense atmosphere. Distal ejecta is still present, but does not travel as far. These factors are in play on Earth too. In large impacts, the distal-most tektites clearly formed at high altitude - they had already passed through the bulk of the inhibiting atmosphere before they formed discrete droplets. The Central European strewnfield clearly exhibits a distribution pattern of ejecta. This is in line with the smaller Steinheim Crater to the west. 1) They are concentrated in rays emanating from the crater. 2) They may be transported or buried. If deeply buried they are lost. Look for where they have been transported to - i.e. gravel deposits as rivers meet lakes or seas. 3) Look for human activity - mining, farming digging foundations, building roads - anywhere where soil is disturbed. 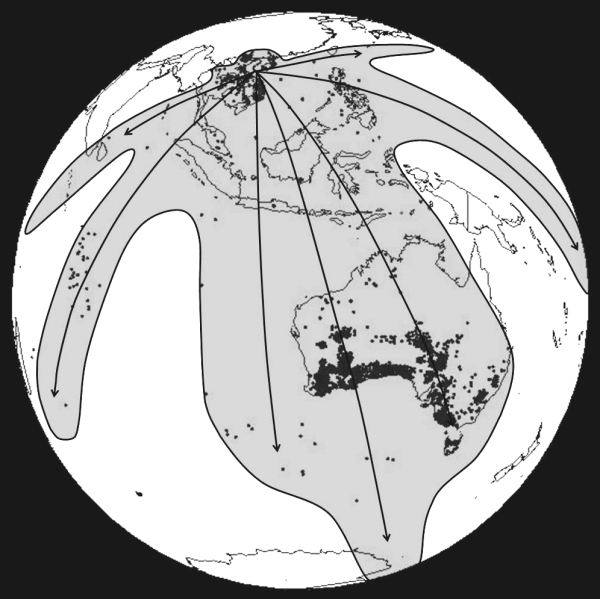 The large and recent Australasian strewnfield clearly shows a non-random pattern. 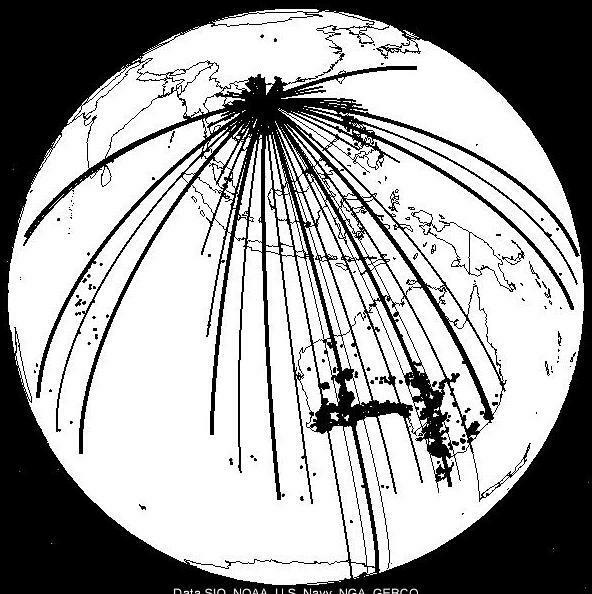 One can make out north-south ejecta rays in Australia (but also E-W lines caused by population bias - where people live and where railroads run). A disting E-W ejecta ray is also present in the Philippines. The distribution pattern can be interpreted to a greater or lesser extent. These are, however, interpretations. A more scientific method is explored in the coming pages.